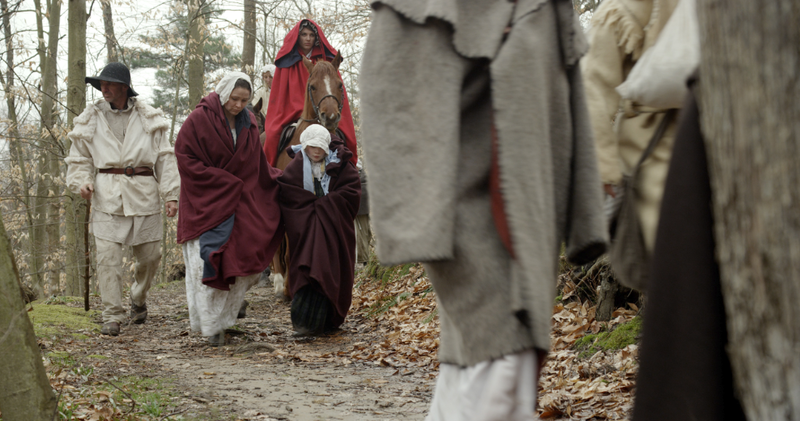 A story that has been two hundred years in the making will have its broadcast debut tonight at 9:00 P.M. on TVO. Narrated by R.H. Thomson, A Desert Between Us & Them: Raiders, Traitors, and Refugees in the War of 1812 is a 120 minute cinematic documentary that explores those stories that make the War of 1812 a “modern war” by stepping back in time to experience the conflict through the eyes of the people of Southwestern Ontario, who spent several years living in a War Zone. For much of the war, the area know today as Southwestern Ontario was a no-mans land, controlled sometimes by the British, sometimes by the Americans, and sometimes by nobody in particular. There were insurgents and bands of vigilante groups loyal to both sides. There were refugee camps and rampant plundering and theft. 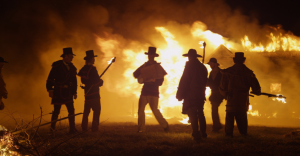 The vast majority of the population were recent immigrants from the United States, who had to decide if they were going to fight for the British, “turncoat” and fight for the Americans, or do what most people did and simply try to stay out of the conflict by whatever means possible. Today, the 200th anniversary of the Battle of the Thames, is a fitting date for the broadcast. 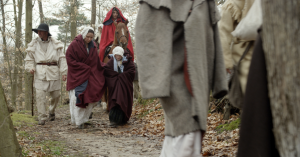 One of the featured topics explored in the film is the fate of the Moravian Delaware from Fairfield (now the Moraviantown Delaware First Nation) whose dramatic experiences leading up to and following the Battle of the Thames are brought to life in vivid detail thanks to diaries kept by the Moravian Missionaries. “These stories also resonated with the re-enactment and volunteer communities who got involved in the project in a big way,” adds Melnick. Over 350 volunteer actors and numerous community organizations and municipalities were directly involved in creating the film, which will be distributed for free, along with a curriculum companion, into every school in Southwestern Ontario this fall. Also watch for the A Desert Between Us & Them mobile app. In addition to the TVO broadcast, viewers can also attend a series of free community screenings in Southwestern Ontario in the fall of 2013 and throughout 2014. Visit 1812.visualheritage.ca for the most up-to-date screening information. DVD and Blu-ray copies will also be for sale starting on October 6th, 2013 at 1812.visualheritage.ca. Click here for an earlier post on ActiveHistory.ca about the development of this film by Karen Dearlove. The project was made possible with the support of the Ontario Trillium Foundation, Heritage Canada, TVO, the Sand Plains Community Development Fund, the 1812 Western Corridor Bicentennial Alliance, and the communities of Southwestern Ontario. A leading grantmaker in Canada, the Ontario Trillium Foundation strengthens the capacity of the voluntary sector through investments in community-based initiatives. An agency of the Government of Ontario, OTF builds healthy and vibrant communities. www.trilliumfoundation.org. Very enlightening programme! Much more background than I previously knew about the devastation that followed the initial battles. Definitely a must see!